Egyptian women took to the streets of Cairo to protest today against women rights violations committed by military officers during the #occupycabinet battle that led to the death of at least 13 protesters over the previous five days. The protest followed the buzz created by a video that showed men in military uniform, dragging a female protester, exposing her underwear, and beating her in the chest. For three weeks prior to the clashes between the army and protesters in downtown Cairo, activists have been staging a sit-in outside the Cabinet headquarters, protesting against the military appointment of Kamal El Ganzouri as the new Prime Minister of Egypt earlier this month. The ongoing battle has so far claimed the lives of at least 13 people, leaving hundreds injured as soldiers battled with protesters in and around Tahrir Square since December 16. Apart from this, the atrocities committed by the soldiers against women shocked the world, prompting Egyptian women to take to the streets and call for dignity today. @AbdeltwabH: near the journalists’ headquarters; the slogan is ”people want the overthrow of the Marshal.” The number is big, more than 7,000. The Marshal is Field Marshal Mohamed Hussein Tantawi, the de facto military ruler of Egypt since the ousting of former president Hosni Mubarak on February 11, 2011. 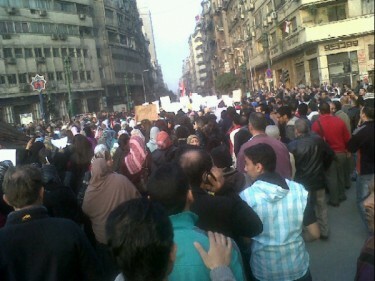 Men also joined the protest and formed a human wall to protect the female protesters. @randamali: Men and women of all classes, ideologies , ages here! #womenMarch. 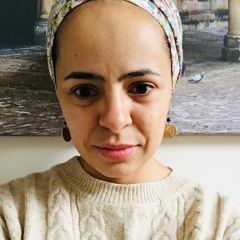 The protesters were not only chanting slogans in solidarity with their female compatriots, who have been brutally beaten up by soldiers, but were also calling for the fall of military rule in Egypt. Here are some of the slogans chanted, and shared via the hash tag #womenmarch on Twitter. The following video, uploaded by sawrageya on YouTube, features female protesters calling for Marshal Tantawi to leave. 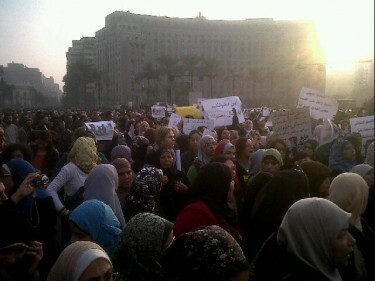 @Egyptocracy: 5.55pm: #womenmarch approaching #tahrir. Way to go girls…let the cowards move in on you again.